As TV's pilot season marches on, it's hard to tell whether it's The CW's new show Jane the Virgin or its star Gina Rodriguez that's getting more buzz. Ever since the network announced the series, which is based on the Venezuelan telenovela Juana la Virgen, critics have been both skeptical and intrigued at just how the show is going to tell the story of a "religious, young, Latina" virgin who gets pregnant when she is accidentally artificially inseminated during a doctor's appointment (woops!). That not enough? The male donor is not only a guy the protagonist, Jane Villanueva, used to have a crush on, but he's also the new owner of the hotel where she works. 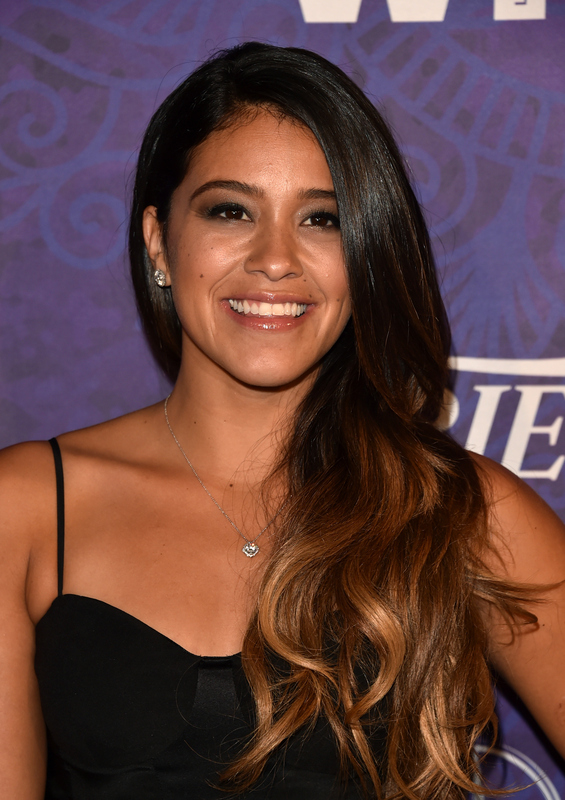 But gaining even more buzz than the show's interesting premise is the star behind it, Gina Rodriguez. The 30-year-old, labeled "The Next Big Thing" by The Hollywood Reporter, has already been getting plenty of press thanks to her outspoken (and awesome) views about working as a Latina actress in Hollywood and how she wants to change the way young Latina women are portrayed on television. And Rodriguez already has plenty of experience with the small screen. Starting her career in 2004, she appeared on shows like Law & Order, Army Wives, and Happy Endings before landing her first recurring role as Beverly on the soap opera The Bold and the Beautiful. Here are some more fun facts to know about the woman who told The Hollywood Reporter that she once dreamed of becoming "the Latino Meryl Streep." Long before Rodriguez was on the silver screen, she was on the stage. The Chicago native with Puerto Rican roots started salsa dancing at the age of seven, dancing with professional companies until she was 17. It was actually dance, she told Complex magazine, that got her bit by the acting bug. “What I realized when I was dancing salsa is that I love to move people," she said. "I realized I was doing it a little bit when I was dancing, but I wanted to use my voice. I wanted to tell stories." Rodriguez was the toast of Sundance in 2012 as the star of Filly Brown, a story about an aspiring East Los Angeles rapper who becomes entangled in the drama of her incarcerated mother. The film was nominated for the prestigious Grand Jury prize, and nabbed Rodriguez an Imagen Award. "I definitely didn't think I would be winning against Eva Mendez and Eva Longoria, so it was very much a surprise, but a pleasant surprise with my parents in the audience," she told Complex. "But it's like, who cares about the awards? Seeing my mom and dad smile, that is my award right there." It was actually while she was trying to discover the voice of Filly Brown that Rodriguez found her own. Rodriguez had never rapped before doing the film, which was originally supposed to center around a spoken word artist. But the film set the actress up with a number of major Latin hip-hop artists, including Baby Bash, that helped her feel ready to jump into the new medium. And now she's gunning for a record deal. "I am talking to some major labels and some indie labels as well, because you definitely have more control of your sound that way," she told Complex. "I'm going to go all in and give it the same kind of heart I gave to acting." Rodriguez has not been shy about her opinions on how Latinos are showcased on television, and at the Television Critcis Assocation summer press tour, revealed that she turned down a role in Lifetime's Devious Maids because she found it "limiting." It was part of a show-stopping speech she delivered that beautifully shared her views on the subject. Here are some highlights, and the full transcription can be found on BuzzFeed. Sadly, right now the perception [the media] have of Latinos in America are very specific to maid, landscape, pregnant teen...I didn’t become an artist to be a millionaire. I didn’t become an actor to wear Louis Vuitton. I have to give this dress back when we’re done. I became an actor to change the way I grew up. The way I grew up, I never saw myself on screen. I have two older sisters. One’s an investment banker. The other one is an doctor, and I never saw us being played as investment bankers. And I realized how limiting that was for me. I would look at the screen and think, ‘Well, there’s no way I can do it, because I’m not there.’ And it’s like as soon as you follow your dreams, you give other people the allowance to follow theirs." The actress continued by saying she picks her roles carefully, only choosing those she thinks will "push forward the idea of my culture, of women, of beauty, my idea of liberating young girls of feeling that they have to look at a specific beauty type." It's clear why she accepted the role of Jane, as the series promises to be something we've never seen before in so many great ways. In her powerful speech, Rodriguez also said, "I wasn’t going to let my introduction to the world be one of a story that I think has been told many times," and it's safe to say that is definitely not the case with Jane the Virgin.